Yesterday should have been our fourth session at dog school – teacher Hannah of Pawfect Dogsense, location Kings Heath Park. I greet Isis who is fast asleep and tweak back the blinds. Bright sunshine bounces through the window and blasts poor Isis. She is petrified. I pick her up and place her gently on the floor. She shoots back to the futon and lies down firmly. I put her back on the floor and, looking horrified, she slinks, low down, to a pad under my desk. Food. I tip her food into her dish. 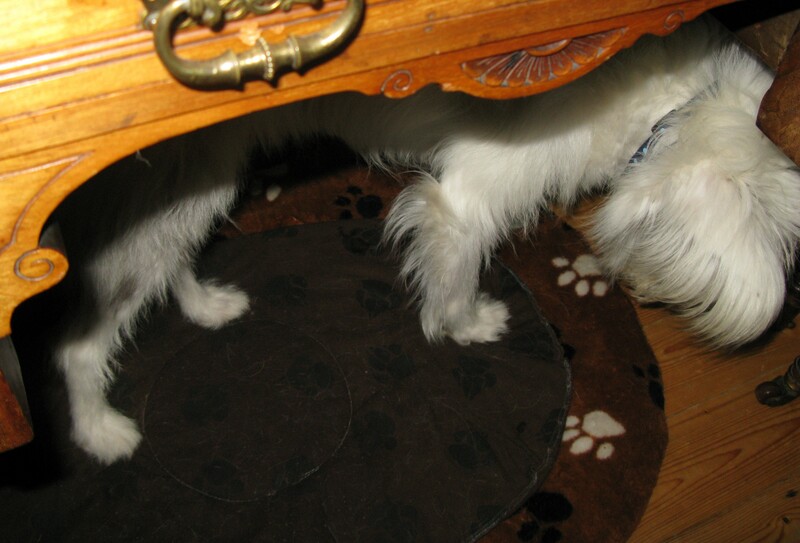 She remains under the desk. This is serious. Retrieving her from her retreat, I carry her to her dish where she gobbles her breakfast, glancing nervously behind and above her. I carry her protesting into the garden where she does the necessary as quickly as she can before dashing back into the house and flattening herself once more under the desk. After a time I put her harness on her and coax her into the hall. But when I open the front door she panics. She is obviously very frightened and would not cope with dog school. Unlike most truants, she does not perk up as soon as it’s clear we’re staying at home, but retires once again under the desk where she stays all day. Memo to me: at night leave the blinds partially open so that even a very bright day will arrive gradually. This entry was posted in we don't like bright sun and tagged deaf/blind dog terrified by sun. Bookmark the permalink.